"Weekend Cooking," (weekly food/cooking feature on my blog, including cookbook reviews, restaurant reviews, and original recipes) Book By Book blog, ongoing. "Healthy Fried Rice Recipe," Vibrant Nation website, September 30, 2015. "Roasted Sausage and Vegetable Dinner," Vibrant Nation website, September 9, 2015. "A Taste of Mardi Gras," (feature with 3 recipes) FamilyFun Magazine, February 2012, p. 70 - 74. "Has Chronic Illness Turned Me Into an Introvert?" ProHealth,October 8, 2018. "Roll with the Punches," ProHealth, August 26, 2018. "Coming of Age with Chronic Illness," ProHealth, July 30, 2018. "Spring Cleaning for Your Spirit," ProHealth, March 17, 2018. "What Makes You Forget?" ProHealth, December 17, 2017. "The Restorative Power of Nature," ProHealth, November 29, 2017. "Orthostatic Intolerance, Part 2: Treating OI," ProHealth, November 3, 2017. "Orthostatic Intolerance, Part 1: Diagnosing OI," ProHealth, November 2, 2017. "Staying Connected with Friends While Ill," ProHealth, September 15, 2017. "Facing Forward: Sue," From This Point. Forward., July 14, 2017. "The Joy of Reading," ProHealth, July 13, 2017. "Travel Tips for the Chronically Ill," ProHealth, June 6, 2017. "When Your Kids Are Chronically Ill," ProHealth, May 15, 2017. "The Challenges of Being a Sick Parent," ProHealth, April 5, 2017. "7 Things You Probably Don't Know About Lyme Disease," thirdAGE, March 14, 2017. "The Importance of Play," ProHealth, February 13, 2017. "Setting Goals When You Are Chronically Ill," ProHealth, December 30, 2016. "The Hidden World of Invisible Suffering," ProHealth, December 16, 2016. "A Plan B Day," ProHealth, October 22, 2016. "What Do You Do When a Loved One Becomes Chronically Ill?" thirdAGE, October 27, 2016. "Keep Learning - Even from Bed!" ProHealth, September 12, 2016. "Where Is Your Journey Taking You?" ProHealth, June 4, 2016. "What Are You Looking Forward To?" ProHealth, May 9, 2016. "Balancing Hope and Acceptance," ProHealth, March 10, 2016. "The Joy of Celebrations," ProHealth, February 4, 2016. "Managing Family Relationships - Holidays and Beyond," ProHealth, December 20, 2015. "Who Do You Tell and What Do You Say?" ProHealth, October 31, 2015. "Birds of a Feather: The Joys of Community," ProHealth, September 9, 2015. "Riding the Chronic Illness Roller Coaster," ProHealth, July 25, 2015. "5 Things I've Learned From Living with Chronic Illness," Mamalode, July 9, 2015. "Finding Joy in Every Day," ProHealth, July 6, 2015. "Sue and Her Sons," Suffering the Silence website, March 5, 2015. "Our New Normal," Guest Post at Mom's Small Victories blog, December 5, 2014. "Treating Immune Dysfunction in ME/CFS," ProHealth, September 21, 2014. “The Path to Acceptance: Finding a New Normal”, Life Skills Magazine, Fifth Edition (Bumper Edition), June 2010, p. 58-63. "Chronic Fatigue Syndrome: An Invisible Illness," livelywomen.com, October 9, 2008. "End of the Road," Your Teen, July-August 2018, p. 60. "Book Learning," FamilyFun magazine, October 2015. "While They Are Sleeping," Mamalode, April 3, 2015. "Celebrate Everything, Big and Small," Mamalode, March 18, 2015. "Tales From the Road," Chicken Soup for the Soul: Parenthood, Chicken Soup for the Soul Publishing, 2013, p. 39. "A Gun in Every Gourd," Chicken Soup for the Soul: Parenthood, Chicken Soup for the Soul Publishing, 2013, p. 68. "The Start of a Beautiful Friendship,"A Cup of Comfort for Friends, Adams Media, 2002. "All the World's a Stage: The Costume Box," Mothering magazine, May/June 2001. "Unexpected Mid-Atlantic: In Delaware's Defense," AAA World magazine, March/April 2018. "Nebraska's Stonehenge," Trailer Life, March 2018, p. 9. "Exploring Cajun Country," My Itchy Travel Feet, December 6, 2016. "Hiking in Kentucky's Natural Bridge State Resort Park," My Itchy Travel Feet, October 20, 2016. "Reconnect with Nature by Staying Off-Grid in a Treehouse," My Itchy Travel Feet, October 6, 2016. "Urban Oasis," FamilyFun magazine, August/September 2016, p. 92 - 94. "How One Family Tracks the Miles" (part of "Road Trip Car Games" feature), FamilyFun magazine, August 2010. "Audio Books" (part of "Road Trip Car Games" feature), FamilyFun magazine, August 2010. "Easy Listening Audio Books," FamilyFun magazine, July/August 2008. "Backseat Boredom-buster," FamilyFun magazine, June 2006. "Four Audio Recordings the Whole Family Will Enjoy," FamilyFun magazine, July/August 2005. "Are We There Yet?" Shawnee Adventures magazine, Spring/Summer 2005. "Seeing the Lights," FamilyFun magazine, December/January 2002. I wrote book, media, and other product reviews for FamilyFun magazine for over 10 years and wrote book reviews for Publisher's Weekly for a year (links available on request). I also wrote a monthly book column for Vital! magazine for one year. I am now a regular reviewer for Shelf Awareness and also write book columns and author interviews for them. Review of An Absolutely Remarkable Thing by Hank Green, Shelf Awareness, October 16, 2018. "Dark and Creepy Fall Reading," Shelf Awareness, October 9, 2018. "Books Coming to the Big Screen," Shelf Awareness, September 25, 2018.
Review of Red, White, Blue by Lea Carpenter, Shelf Awareness, September 18, 2018.
Review of Where the Crawdads Sing by Delia Owens, Shelf Awareness, August 14, 2018. Author Interview: "Delia Owens: Survival, Nature and Isolation," Shelf Awareness, August 14, 2018.
Review of Her Pretty Face by Robyn Harding, Shelf Awareness, August 3, 2018.
Review of The Possible World by Liese O'Halloran Schwarz, Shelf Awareness, July 20, 2018. "Give Your Graduate a Book!" Shelf Awareness, June 5, 2018. "Remembering the Fallen Through Fiction," Shelf Awareness, May 25, 2018. Author Interview: "Stephen McCauley: Combining Humor and Insight," Shelf Awareness, May 8, 2018.
Review of My Ex-Life by Stephen McCauley, Shelf Awareness, May 8, 2018. "The Mother of All Books," Shelf Awareness, May 4, 2018. Author Interview: "Heather Abel: Activism, Growth and Disillusionment in the 90's," Shelf Awareness, May 1, 2018.
Review of The Optimistic Decade by Heather Abel, Shelf Awareness, May 1, 2018.
Review of We Own the Sky by Luke Allnut, Shelf Awareness, April 27, 2018. "Earth Day: Dig Into a Good Book!" Shelf Awareness, April 20, 2018. "Spring Has Sprung!" Shelf Awareness, April 6, 2018.
Review of Speak No Evil by Uzodinma Iweala, Shelf Awareness, April 3, 2018.
Review of Only Child by Rhiannon Navin, Shelf Awareness, February 27, 2018.
Review of Hap & Hazard and the End of the World, Shelf Awareness, February 6, 2018.
Review of NightSun by Dan Vining, Shelf Awareness, January 30, 2018.
Review of Artemis by Andy Weir, Shelf Awareness, January 5, 2018.
Review of The Ninth Hour by Alice McDermott, Shelf Awareness, October 20, 2017.
Review of The Hunting Accident: A True Story of Crime and Poetry by David L. Carlson and Landis Blair, Shelf Awareness, October 6, 2017.
Review of Exposed by Lisa Scottoline, Shelf Awareness, September 19, 2017.
Review of The Atlas of Forgotten Places by Jenny D. Williams, Shelf Awareness, August 11, 2017.
Review of Everybody's Son by Thrity Umrigar, Shelf Awareness, July 18, 2017.
Review of How to Be Human by Paula Cocozza, Shelf Awareness, June 6, 2017.
Review of The Last Neanderthal by Claire Cameron, Shelf Awareness, May 16, 2017. "On the Bookshelf: Love is a Many-Splendored Thing," Vital! magazine, February 2016, p.15. "Improve Your Life with Books in 2016," Vital! magazine, January 2016, p. 15. "9 Awesome Books to Read Aloud to Your Tween," BonBon Break, November 17, 2015. "The Book Lover's Gift Guide," Vital! magazine, November/December 2015, p. 17. "Choose Your Next Book From Award Lists!" Vibrant Nation website, September 4, 2015. "Keep Learning with Books," Vital! magazine, September 2015, p. 7. "Summer Reading," Vital! magazine, July 2015, p. 15. "Father's Day is June 21: Give your favorite Dad one of these great books or celebrate the day by reading about fathers!" Vital! magazine, June 2015, p. 12. "Celebrate Mother's Day with a Good Book," Vital! magazine, May 2015, p. 10. "Coming Soon: Favorite Books on the Big Screen," Vital! magazine, April 2015, p. 15. "A Fairy Tale for the 21st Century," FamilyFun magazine, May 2012. "A Game of a Different Color," FamilyFun magazine, April 2012. "The Return of the Peanuts Gang," FamilyFun magazine, November 2011. "A Popular Character is Back," FamilyFun magazine, June 2011. "Movies You May Have Missed," FamilyFun magazine, June 2011. "Magical Tales From a Master Storyteller," FamilyFun magazine, April 2011. "Edge-of-Your-Seat Audio Fantasy Novels," FamilyFun magazine, February 2011. "Classic TV on DVD," FamilyFun magazine, June/July 2010. "Audio Books That Turn Up the Adventure," FamilyFun magazine, February 2010. "Can You Spell F-A-S-T?" FamilyFun magazine, August 2009. "A Soccer Movie That Scores," FamilyFun magazine, June/July 2009. "Gather Round, Me Hearties, for a CD That's Pure Gold," FamilyFun magazine, May 2009. "Build Virtual Contraptions on Your PC," FamilyFun magazine, April 2009. 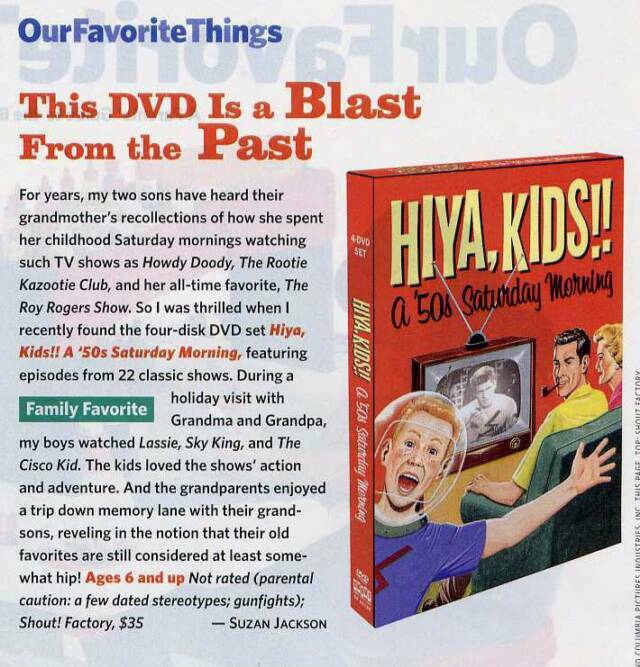 "This DVD Is a Blast From the Past," FamilyFun magazine, February 2009. "This Cartoon Stands the Test of Time," FamilyFun magazine, September 2008. 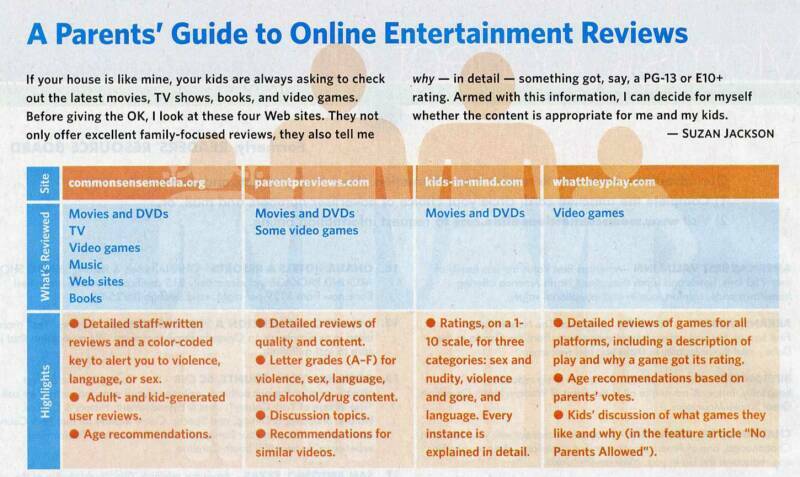 "A Parent's Guide to Online Entertainment Reviews," FamilyFun magazine, June 2008. 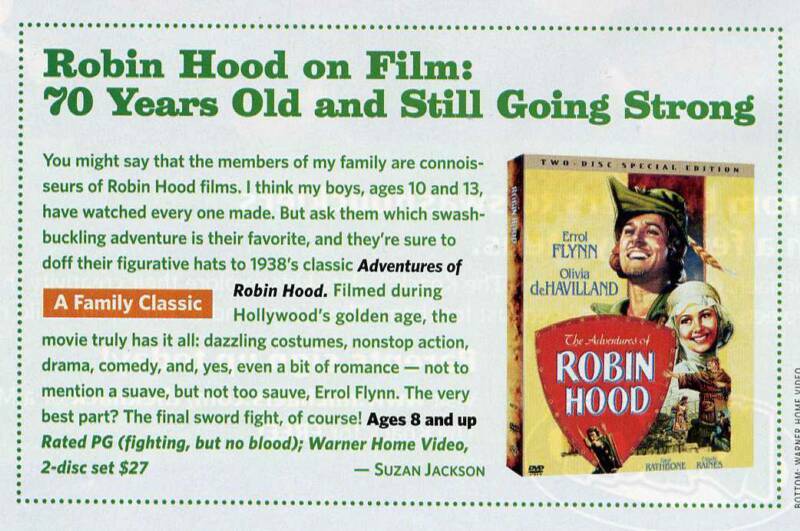 "Robin Hood on Film: 70 Years and Still Going Strong," FamilyFun magazine, May 2008. 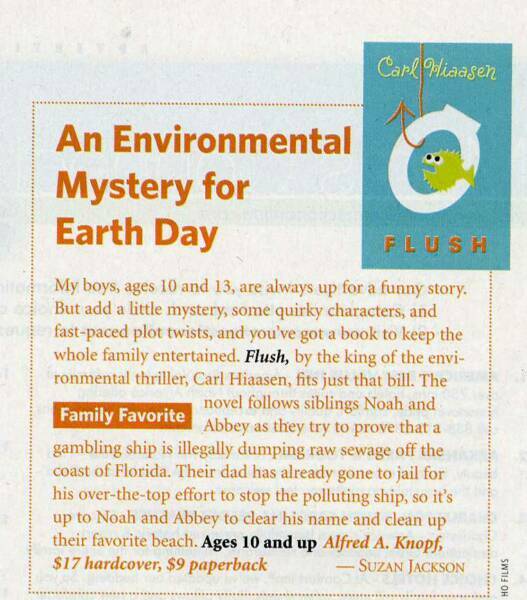 "An Environmental Mystery for Earth Day," FamilyFun magazine, April 2008. "A Doggone Good DVD," FamilyFun magazine, March 2008. "A Kid-Pleasing British TV Show on DVD," FamilyFun magazine, June 2007. "A Great Nonfiction Book Series for Beginning Readers," FamilyFun magazine, April 2007. "Puzzle Fun for Everyone," FamilyFun magazine, April 2007. "Lively Audio Tales for the Whole Family," FamilyFun magazine, March 2007. "Watch a Concert From Your Couch," FamilyFun magazine, March 2007. "3 Audio Books To Make Travel-time Fly: Half Moon Investigations," FamilyFun magazine, December/January 2007. "Sleepytime Stories," FamilyFun magazine, October 2006. "Lions and Tigers and Bears Oh, My on DVD," FamilyFun magazine, July/August 2006. "A Picture Book for Dress-Up Divas," FamilyFun magazine, June 2006. "Your Family Will Flock to This DVD," FamilyFun magazine, June 2006. "A Portable Prints Primer," FamilyFun magazine, June 2006. "Hope and Hoops Fill This DVD," FamilyFun magazine, June 2006. "Books by Cornelia Funke," FamilyFun magazine, May 2006. "Subterranean Adventures in an Exciting Book Series," FamilyFun magazine, May 2006. "A Modern Tale of Ancient Greek Gods," FamilyFun magazine, April 2006. "Great Catches for Baseball Fans: The Sandlot," FamilyFun magazine, April 2006. "Video Games Perfect for Holiday Travel," FamilyFun magazine, November 2005. "Spooky Movies for Scaredy Cats," FamilyFun magazine, October 2005. "Crazy About Pirates: Great Stuff for the Obsessed Kid," FamilyFun magazine, June 2005. "A Glorious Game," FamilyFun magazine, March 2005.